With one game left in the regular season, Iguanas haven't clinched a playoff spot yet, but they're very close now. 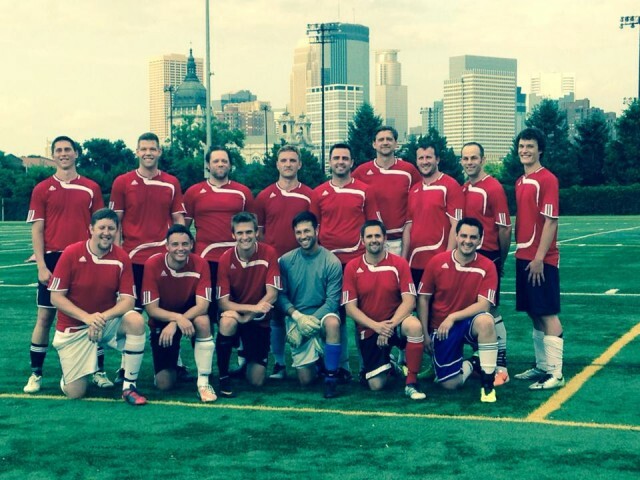 Iguanas visited Brit's Pub FC at Parade Stadium in downtown Minneapolis on a warm August Wednesday evening. The weather was much better than when the game was originally scheduled and got postponed due to a severe thunderstorm. This time around, the only precipitation was in the back of the Brit's Pub FC net. The scoring got under way very early as Iguanas attacked up the right side of the field. Kerry Burns had his shot blocked at the top of the box, but Barry Sniezek came in for cleanup. Sniezek pounced on the rebound and hammered home a left-footed volley to give Iguanas the lead. About ten minutes later, Iguanas struck again. With Brit's Pub FC maintaining a high back line for the offside trap, midfielder Silviu Chiriac sent a great long ball over the top to Josh Hanson. The Brit's Pub FC keeper came off his line to try and stop Hanson, but he chipped the ball perfectly over the top and into the net to give Iguanas the 2-0 advantage. Towards the end of the first half, it looked like Brit's Pub might get a goal back thanks to a highly questionable call. Defender Eric Thompson won what looked to be a clean header off a throw-in, but the center referee claimed he elbowed a Brit's Pub player in the back (who conveniently fell to the ground at the first hint of contact). A penalty kick was called and the player who was "fouled" lined up to take it. The shot was on target but Iguanas keeper Zak Prauer was more than equal to the task and kept the ball out. The teams went into halftime with the score remaining at 2-0. Iguanas dictated most of the play in the second half, but their lackluster finishing early on kept Brit's Pub in the game. Finally with about 15 minutes left in the game, Iguanas put the game away for good. Chiriac capped off an impressive series of passing in the attacking third with a through ball to Burns, who rifled the shot home to give Iguanas a 3-0 lead. Burns struck again five minutes later off a throw-in from Jeremy Leinberger. Burns settled the throw-in, made a quick move to his left, and slotted home the fourth and final goal of the game. The final whistle blew and Iguanas had secured the full three points for the first time in their past six games. JAWA FC can technically pass Iguanas in the standings, but they would need a victory combined with an Iguanas loss AND make up 14 goals in goal differential in the process.